Satisfactory operation of a transformer solely depends on the condition of the oil. It is required to keep the oil clean and dry. With the rise of temperature, the oil level increases. Rise of temperature depends on the load of the transformer. If load increases, oil expands. If load decreases, contraction of oil occurs. Since smaller transformers are not totally filled by oils, some space is left between tank walls and oil, which is occupied by air. The tank is connected to the atmosphere through a vent pipe. Air is expelled out if oil expands. Air is drawn from the atmosphere if oil contracts. When air enters the transformer, it is required to extract moisture from the air. An apparatus known as breather is used to extract moisture from the air. It is a small container connected to the vent pipe containing a dehydrating material such as silica gel crystal impregnated with cobalt chloride. The colour of the material is blue when it is dry. It becomes whitish pink when it is damp. In front of the container, a glass window is provided to observe the colour of the material. If the transformer becomes overloaded, it overheats the oil and sludge formation occurs in the presence of air. 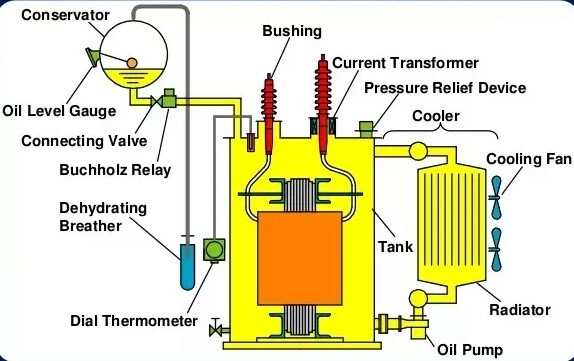 If transformer suffers short circuit, temperature rise becomes very high and this causes vaporization of a part of the oil, which forms an explosive mixture with air. This explosive mixture can ignite and cause considerable damage. To prevent the air coming in contact with air as well as moisture, conservators are used. It takes the responsibility of expansion and contraction of oil without allowing it to come into contact with air. The conservator is an air-tight cylindrical drum mounted on or near the cover of the transformer. It is connected to the transformer through a small pipe. In Figure 1.18, breather and conservator are shown.